NEW YORK, Sept. 13, 2017 /PRNewswire/ -- Loews Hotels introduces Flavor by Loews Hotels, an innovative food and beverage experience serving up the best local flavor right within the four walls of the hotel. Rolling out nationally this year, Flavor by Loews Hotels is built on partnerships with artisan food & beverage vendors ranging from bakers to ice cream makers. The indigenous products are showcased on menus across the brand's portfolio, enabling guests to experience a taste of the destination without ever having to step off property. Loews Hotels is one of the first hotel brands to embrace local partnerships on a national scale, satisfying guests' desires to immerse themselves in the destinations -- bite-by-bite and sip-by-sip. The Flavor by Loews Hotels program was born at Loews Miami Beach Hotel, which perfectly captures the iconic culture of Miami through its partnerships with an amazing cast of the city's finest food & beverage purveyors, including Azúcar Ice Cream, Zak the Baker, Miami Club Rum and more. Based on the success of Flavor Miami, all Loews Hotels from coast-to-coast are now introducing the best of their destination's food and drink artisans, so guests can truly dine like a local. "Each Loews Hotel has curated Flavor partners that not only are 100 percent unique to that destination but also seamlessly integrate into the food and beverage experience of that hotel," says Ken Harvey, Executive Chef of Loews Ventana Canyon Resort. "In Tucson, our cuisine pays homage to the Southwest's rich Mexican and Spanish heritage, and we embarked on a mission to find our hometown's most popular purveyors. That is what makes this program so different, it allows us to align with local eateries that inspire us, and in turn, take our culinary experiences to the next level." "Flavor by Loews Hotels goes beyond the farm-to-table movement of highlighting native ingredients on restaurant menus; we're offering guests celebrated and locally-known products from resident artisans right within the walls of our hotels," said Mark Weiss, Senior Vice President of Food & Beverage of Loews Hotels & Co. "By partnering with the finest bakeries, smokehouses, distilleries, breweries, juice shops and more, our hotels are not only becoming a part of their local scene, but are also helping to nurture and support their hometown communities." Loews Ventana Canyon Resort has partnered with Tucson Tamale Company to serve its tamales, whose decidedly local products have been hailed by Alton Brown of The Food Network as "the best tamales in the USA." The Tucson-based company takes pride in the high quality and consistency of its mouthwatering tamales, relying upon locally sourced ingredients including organic non-GMO corn and Santa Cruz Red Chile to create delicious, naturally gluten-free fare. In Seattle, Loews Hotel 1000 is hooking guest appetites with smoked salmon from one of Seattle's first official smokehouses, Jensen's Old Fashioned Smokehouse. As the main supplier of smoked goods at Pike Place Market for 30 years, family-owned Jensen's will feature locally enthused dishes such as Wild Garlic & Pepper Keta Smoked Salmon and Wild King Candied Salmon at the hotel's All Water Seafood & Oyster Bar, and will develop an exclusive recipe only for the hotel. In addition, Grand Central Baking Company supplies special pumpernickel bread for the restaurant's Smoked Salmon Rillettes. Launched 28 years ago in Pioneer Square, the family-owned bakery uses sustainable Washington State grains and wheat for artisan and specialty breads. In Nashville, guests can brighten their stay at Loews Vanderbilt Hotel with Whisper Creek Tennessee Sipping Cream and Pickers Vodka from SPEAKeasy Spirits, available on tap and through monthly "Craft of Draft" cocktail specials at the hotel's Mason Bar. The artisan distillery of husband-and-wife team Jeff and Jenny Pennington, based in Nashville's historic Nations neighborhood, taps grain from local Tennessee farmers and gives back stillage (the post-distilling leftovers) to feed local farm animals. 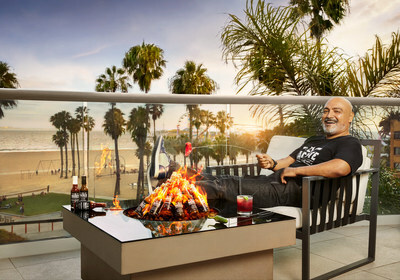 Move over, Tabasco: El Machete Chilli Sauce is the hot-and-spicy ingredient of choice at Loews Santa Monica Beach Hotel. Based in Boyle Heights east of Downtown Los Angeles, El Machete is a high-quality, Mexican-like chilli sauce handcrafted in micro-batches by owner Oscar Ochoa. The son of Mexican immigrants, Ochoa is an artist as well as a sauce brewer and co-founder of El Machete Artist Collective, which advocates for arts, culture, education and civic responsibility to improve life for local low-income communities. El Machete is featured in a signature cocktail and in assorted dishes at the hotel's celebrated restaurant, Ocean & Vine. Guests will scream for Little G's Ice Cream at Loews Boston Hotel. Handmade locally, Little G is the work of teenage owner/founder Grace Conner, who was motivated by the cream parlor she frequented during her summers on Nantucket, and became a gifted ice cream maker at only the age of eight years old. In January 2016, she walked through a snowstorm to deliver her first batch of Little G to a specialty grocer in Boston's South End: It sold out in a week. Conner will attend Stanford University this fall while Little G's Brownie Fudge, Cookie Dough and Peanut Butter Cup ice creams are on the menu at the hotel's Precinct Kitchen + Bar. What says New York more than pizza? Inspired by one of New York's favorite meals, the Loews Regency New York Hotel is introducing two exclusive pizzas made with charcoal crust from Olivella Bread. Served at the Regency Bar & Grill, both the Truffle and Diavolo pizzas are fashioned atop charcoal dough from the quintessential pizza creator, whose Naples, Italy-born founder Salvatore Olivella has made a name for himself through consultations with top New York City pizza spots as well as ownership in restaurants in the tri-state area and Dallas. To learn more about Flavor by Loews Hotels, check out this video. Flavor by Loews Hotels will launch across the brand by the end of 2017. For more information on Flavor by Loews Hotels visit www.loewshotels.com/flavor.